Our guest today is Roshani Chokshi – author of The Vishakanya’s Choice – with her thoughts on Crimson Peak. Crimson Peak is a visual feast from the beginning. And although its staid plot seems too easy, it’s in the details where the film shines. The film moves quickly from the initial meeting between Edith Cushing (played by Mia Wasikowska) and Sir Thomas Sharpe (played by swoony Tom Hiddleston) and dives into a dazzling courtship. My favorite scene is the ball, where everything is sinister only in hindsight. Imagine sumptuous ballrooms where heiresses pile their hair into curls and expose swan-slim necks, a room where low-hanging chandeliers glint knife-sharp and symphonies of heavy silks scrape the floor. And, of course, where suave ol’ Sir Sharpe pours poetic sorrow in his eyes, jilts his expected partner, and whisks Edith into an incandescent waltz with a candle in his hand and tenderness in his brow. Interestingly, the romance hinges on Edith’s aspirations as a writer. Scorned by an editor because she wrote a ghost story instead of a romance, Edith appears taken by Sharpe’s sincerity in her ability as a writer. It’s a delightful change from the usual insta-love, and viewers will sympathize with Earnest Edith’s goals. Lurking in the background, Lady Lucille Sharpe (played by a chilling Jessica Chastain) barely blinks, sulks in her tight-laced brocade, and taunts viewers with the Super Dark Secret she harbors. But the romance is short-lived. In a rushed sequence (as if Guillermo del Toro forgot he called this a horror film), a series of violent acts catapults the lovers into matrimony. Here is where del Toro’s imagination shines. 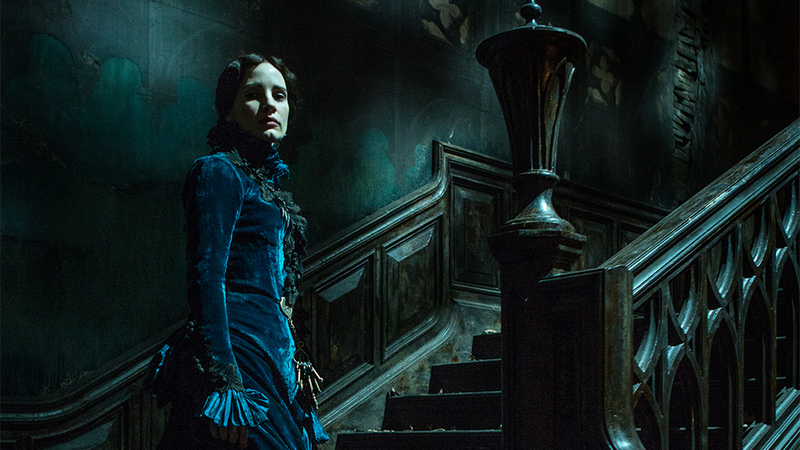 The ruined beauty of Crimson Peak’s mansion is the stuff of ghost stories whispered in the dark. The house’s wounded foundation oozes clay a disturbing shade of scarlet. Peeling mirrors bare their silver bones. Ghosts with livid skin walk disjointedly down the halls. And through a torn ceiling, snow drifts and covers the oozing red clay to present a picture of a blood-splattered winter. Against this gorgeously gruesome setting, the tale descends into a gender-swapped Bluebeard tale. It’s not handsome Hiddleston who presents the horror, but his sister. Chastain holds all the keys (literally), harbors the Super Dark Secret, and threatens over tea. The capacity for dreadfulness lies in the women, and its at this juncture that Hiddleston takes the backseat as a handsome ornament. Both women fight for agency. For Edith, she demands sovereignty in her home: answers, a set of house keys, and consummation without her sister-in-law’s ill-timed tea preparations. Refreshingly, it’s Edith who takes her desire in her own hands, seduces her husband, and seeks answers. She’s a protagonist with an agenda, and so is her well-matched enemy. Lucille and Thomas’s Super Dark Secret is shocking, yes, but predictable. Still, it’s how the characters want things so viciously that elevates this beautiful film into a memorable one. My advice to those who choose to watch this film is not to think about it too deeply. There are some questionable plot devices, and a gleeful indulgence in gore, but it’s a movie that masters its story with atmosphere and frightening females. The details — broken wings, insect carapaces, and luscious costumes — are a story themselves. Crimson Peak is romantic and devastating. It wants you to be enamored with its grotesqueness. 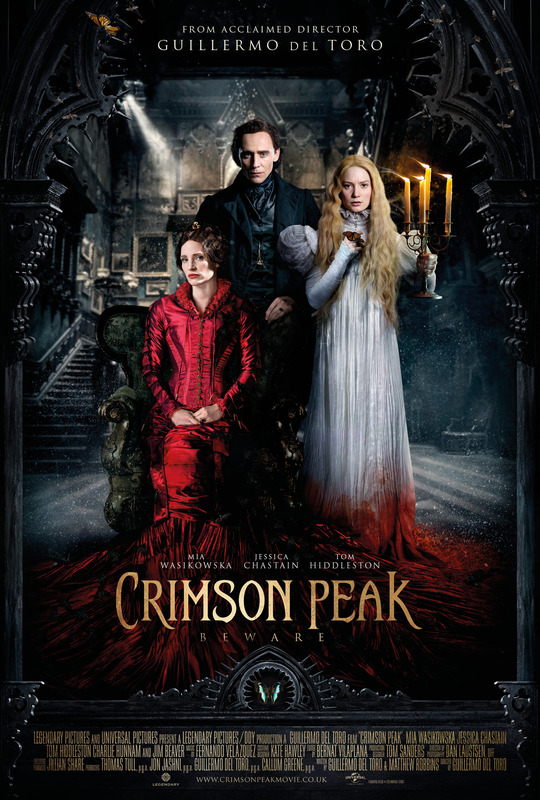 And despite its warnings — “Beware of Crimson Peak!” — you’ll find it easy to love. Roshani Chokshi lives in the land of grits and boiled peanuts. Her family is ruled by a Great Pyrenees overlord known by the cryptic name of “Panda.” Her unpublished manuscript was a 2014 Daphne du Maurier finalist and she was a finalist in the 2014 Katha Fictions Contest. 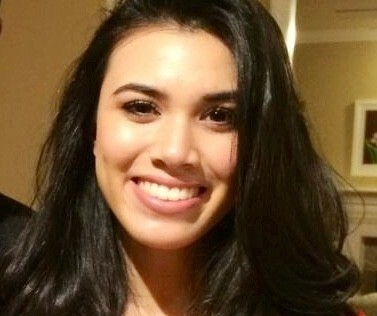 She studies law by day and writes fantasy by night. Her first novel, The Star Touched Queen, is forthcoming from Macmillan in 2016. You can read her story “The Vishakanya’s Choice” for free here.